I don't know if you're familiar with the youtube channel of Tek Syndicate, but they tend to report stories in the nature of what you post a lot of the times. So if you wanted to reach a larger audience you should check out their news forum. Anyways keep up the good work, I miss this site, seems to have slowed down quite a bit. My home town is technically in Taipei, I have residency there, but my family lives in Nangang. As you may know, I am currently living abroad in Mass., USA for grad school. Getting to know each other is fine. Yes I am from Taiwan. I mainly come to this site (it's been like over seven years?) to see news postings. It all started with asking questions about mapping in WC3 haha! I'm probably around 10 years for me. To see a comrade out in the wild is surprising. Yay! Got myself an updated avatar! 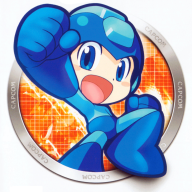 Still liked this version of Mega Man, but I can also choose to switch to a different one anytime. Hello, Tom. As promised, the OpenGL terrain source: https://github.com/monovertex/fractal-terrain. If there's anything, please ask, but I will not be able to provide extensive support, as I'm under heavy assault from homework and the like at the moment. Don't worry, I'll see what I can. As I promised, coming back with the Spinning Wheel tutorial: http://www.thehelper.net/threads/tutorial-css-spinning-wheel.160910/. If find anything unclear, please send me a PM. What I mean to say was, would you like to contribute your autobiography, from the days of yourself joining this forum to present day, to The Helper Forums Site History project? Because I can't write something that belongs to you and only you can be able to write your history down in the forums. You have a site history section being done about you. Would you like your forum name changed to Tom Mai? Didn't realise we shared a time zone. So you're leaving tomorrow? That! I thought no one is using it. :O Is it possible to repair it, since the portal and the original one are different by their height? I'm not sure height makes a difference, I think repairing should work fine. Sounds like mylongshanks might fix it, though. We use the portal to get back to our current area when we die (so it may have been broken for a while). Yesshh... I'm officially now a super moderator. I'm sad that this place isn't getting the activity that it shouldn't be. It'd seem that you're the only one keeping the site up so far. It's pretty much dead elsewhere. Keep it up, tom. I'll update my status to reflect on current events. I'm no longer a Minecraft host, as my VM that hosts the server is longer servicing. Yo bro', just wanted to extend a thank you from me and probably most of the rest of us that regularly post on the news threads. Without you, TheHelper.net would be a greatly diminished site in my eyes. Your dedication is invaluable, so again... Thanks! Would you be interested in a News forum mod position? The advantage is that you post straight to the News forum and don't have to be approved. You have to move posts, even your own to submissions if they have less than 50 views and/or under 3 replies in a day or if it looks like a post after half a day is not going to meet that. Not all submissions get moved to News, only ones you think are interesting and you think will be commented on or popular viewed. What u say? I might visit Taipei some day and want to know a few things about it. Omg! You play minecraft. Such a coincidence. I was reading Notch's blog and on the right I saw: "@tom_mai78101 There are some, but it's not that bad. I'm pretty productive nowadays. =)". I was like: "Hey, aren't there a guy called tom_mai or something on TH?" I love minecraft. I just wanted to tell you. Anyway Thanks for the congratulations. Learning the ropes. Been learning since 2005.